I have been on a baking frenzy! These lemon pound cake cupcakes are simply delicious. The secret ingredient? TOFU! Ha! Betcha didn’t know they contained something healthy. Well, too bad all the sugar counteracts the goodness of tofu, but the tofu replaces the egg in this recipe. Can’t even tell the difference – not even my coworkers, who are most likely scared of tofu, lol. 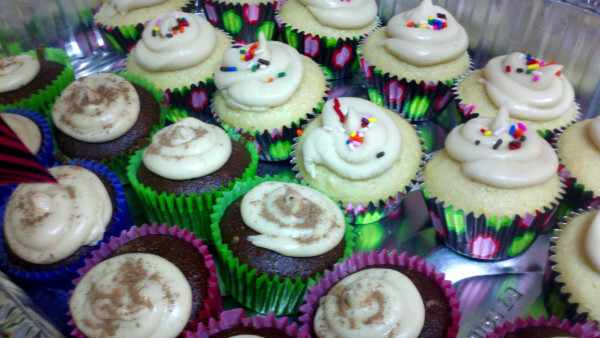 I used the same vegan frosting recipe as I did on the Coconut Beach cupcakes, but without the blue food dye. Make these at your next house party, let everyone eat them, then tell ’em they’re vegan. Watch their faces. ;-) They’ll probably still be licking their lips! Preheat oven to 350 degrees. Make your frosting and put it in the fridge so it chills nicely so you can frost the cupcakes when they’re cool. In your food processor, blend the tofu until silky and smooth. Make sure there aren’t any lumps, or it will be gross. I add a couple tablespoons of water if it seems to be chunky when blending. With a cheese grater, grate the zest off both lemons and squeeze the juice into a separate bowl. In a medium bowl, mix together flour, sugar, butter, tofu, water, vanilla extract, baking powder, lemon zest and lemon juice. Mix well by hand using a wooden spoon, or put it in your stand mixer until smooth. Place your cupcake liners in your cupcake pan and fill each cupcake liner 1/2 to 3/4 full of batter. I like to fill mine fuller because I like the cake to rise over the top of the cupcake liner. Bake for 30 minutes at 350, or until centers of cupcakes come out clean with a fork. Frost with the vegan vanilla icing and add sprinkles! PS: I’ll post the chocolate recipe in a different blog posting! Stay tuned!